Canada’s favourite SUV in May 2013, for the fourth time in five 2013 attempts, was the Ford Escape. Sales jumped 22% and are up 12% year-to-date. The Escape is now 3763 sales ahead of its nearest rival for ultimate year-end leadership. The Toyota RAV4, however, would need to outsell the Escape by an average of 538 units per month over the remainder of 2013 to take over the best seller’s crown. Not gonna happen. The fifth place Dodge Journey ranked second among SUVs and crossovers one year ago. 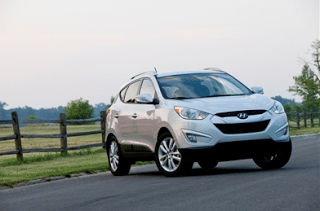 The tenth-ranked Hyundai Tucson reported its best month, by far, since July of last year. The Tucson last cracked the top ten in November 2012. The 15th-ranked GMC Terrain, when combined with its Chevrolet Equinox fraternal twin, trailed the segment-leading Escape by 1403 units in May. In other words, Escape sales were 42% stronger. South of the border, joint Equinox/Terrain volume in May, the Escape’s best sales month ever, was 5.6% stronger than Escape volume. Another combo, the Jeep Compass and Jeep Patriot, Canada’s 19th and 20th-ranked utility vehicles in May, outsold eight of the SUVs and crossovers on this list. One wonders about their viability when the new Jeep Cherokee arrives, although their affordability may make the Cherokee itself a tough sell. Historical monthly and yearly sales figures for any of these models can always be accessed through the dropdown menu at GCBC’s Sales Stats page, and for those not viewing the mobile version of this site, near the top right of this page, as well. GCBC has already published rankings for brands and 13 different trucks and will also publish a list of the 20 best-selling cars in Canada shortly, but these were the 20 best-selling SUVs and crossovers in the Canada in May 2013. A complete listing of all SUVs and crossovers should be out later this week or early next week. * Santa Fe Sport doesn’t include the Santa Fe XL, which Hyundai lists separately. Combined, Santa Fe/XL sales were up 28.3% to 2723, up 23.7% to 11,158 through five months.